Fordham University Press. 2013. 63 pages. I won’t mention what this might entail. 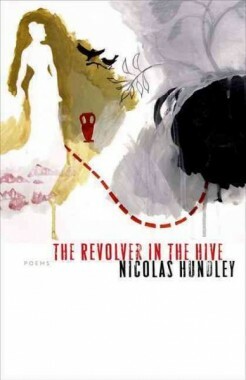 The poems throughout Revolver in the Hive are the “noise / escaping from the urn.” At the center of Nicolas Hundley’s masterful first book is grief, but it’s a grief that takes on peculiar forms. In the first three sections, the grief is dislocated from the surreal world the various speakers and characters inhabit, appearing mostly through tone. Many of the poems in these opening sections have a frenetic pace to them, as in “They,” where “They gave out roots, ate roots. Always / with their sickness, sickness / of numbers.” In these poems we are aware that we are witnessing a mind obsessing, and, although in some poems such as “Tooth and Blur,” where “I had become the grief. I gnashed and bit / at the air,” grief is directly spoken of, we are left on unsure footing as to the cause of the speaker’s emotional upheaval. only printouts-–a Tourette’s of symbols-–as souvenir. This is a collection which relies on the unique powers of poetry to evoke and allude. Hundley wields these powers in a deliberate and accomplished way that is ultimately very affecting.